· Teachers can request reviews of materials they hear about from colleagues in other districts. Then, teachers/curriculum teams can use our alignment reports on an ongoing basis to help them assign only the portions of their districts’ materials that are truly aligned to the depth and rigor of each standard. Thus, Learning List functions as an extension the school/district’s curriculum department. “Learning List helps districts use their instructional materials instructionally.” Pat Hardy, Texas State Board of Education member. While alignment is critical to student success, Learning List also provides an editorial review addressing equally important attributes of each material’s instructional content and design, including focus, coherence, rigor, ease of use and adaptions for special populations. (3) Learning List is standards agnostic: Learning List has no allegiance to any particular set of standards. Developed in response to requests from educators who were tired of purchasing materials that failed to live up to publishers’ alignment (and other) claims, Learning List reviews materials aligned to a variety of standards, including state-specific, Common Core and Advanced Placement. Reviews for Next Generation Science Standards (NGSS)-aligned materials will be released in summer 2015.
educator ratings and reviews based on specified criteria consistent with effective teaching practices. Thus, the only “ratings” provided are those of educators who have used the products with students. All products are completely reviewed and reviewed against the same criteria for each of the 3 types of reviews to make it easy for subscribers to compare materials on an equal playing field. Learning List’s reviews are accompanied by a completed publisher questionnaire, in which the publisher presents their product directly to our subscribers; Learning List does not edit the publisher’s responses. (5) Learning List is subscription-based. We offer our service for a low, annual subscription rate. Campus- or district-wide annual subscriptions are based on student enrollment with rates starting at $1/student and decreasing as enrollment increases. After all, if a campus/district is going to spend $75+/per student on new instructional materials this year, doesn’t it make sense to spend $1 or less per student to choose and then use their instructional materials more effectively? A nimble company with a sustainable business model, Learning List responds quickly to educators’ evolving needs in a rapidly changing marketplace. 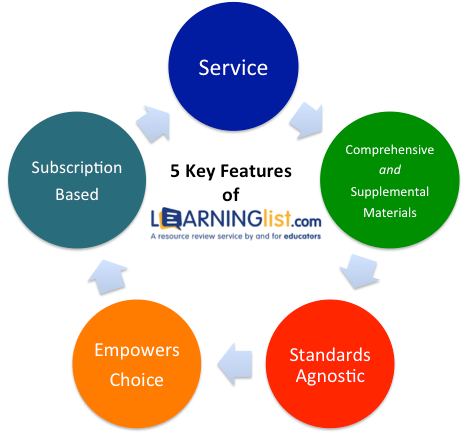 More information about Learning List’s Features and Methodology is available here.